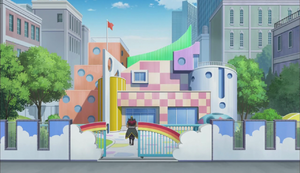 Den City's orphanage is an unnamed location in the Yu-Gi-Oh! VRAINS anime. George Gore grew up here and uses the money he gains from his job as a Celebrity Duelist to help fund the orphanage. Some of the rooms inside of the orphanage are equipped with TV screens, play mats, and bookshelves inset into the walls. One of the rooms additionally holds a bear stuffed toy that bears a resemblance to Gore's design.